The geology of the Dallas-Fort Worth Metroplex is for the most part stable. The metropolitan area sprawls across the western edge of slanting Cretaceous sediments and on the eastern edge of the Fort Worth Basin; both of which overlay the Texas Craton. This can be observed in the over-simplified sketch in Fig 1 below. A directly observable example of the craton is in Fredericksburg, TX where it outcrops at Enchanted Rock State Natural Area. The layered Cretaceous rock outcrops can be seen in creek/river cuts, highway cuts and quarries. Local geologic maps coupled with the most recent topographic quads and a GPS are your best tools to track these down. In the Western area of the Metroplex pinch-outs created by the upward-trending basement into the slanting Paleozoic rocks are prolific producers of natural gas. The DFW Metroplex sprawls across a 100 kilometers (62 mi) wide N-S trending belt of outcropping Cretaceous sediments. Fort Worth in the west is built on Early Cretaceous Comanche Series. Dallas in the east is built on Late Cretaceous Gulf Series sediments. DFW lay on the beach about 110 Ma, during early Cretaceous time. The water systematically rose for another 30-50 million years, so by the time the coccolithophorid Austin chalk was deposited, the benthic environment that became DFW lay 100 meters (328 ft) or more below the sea surface. The relentless rise in sea level was only interrupted by tectonic movements in southern Arkansas and Oklahoma, resulting in deposition of huge layers of Woodbine Sandstone to the south. These sandstones underlie the cities of Denton, Grapevine, and Arlington. This is quite evident in the reddish, sandy soil found nearly everywhere in these locations (but more importantly the lack of black, gumbo clay found most everywhere else in the Metroplex). The Cretaceous sediments dip a degree or so to the east, so the Cretaceous sediments get younger towards the east. Sediments deposited during the Cretaceous-Tertiary extinction event, that ended the dinosaurs eras, lie near the city of Terrell, TX. People enjoy searching for fossils in the rocks around Dallas. 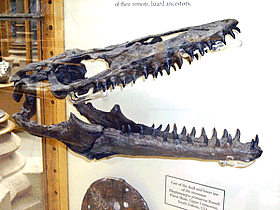 Remnants of dinosaurs and Late Cretaceous marine reptiles such as the Mosasaur can be found. One species of Mosasaur was named after the city: Dallasaurus turneri. Note however, these larger fossil specimens were found quite by accident during large scale excavation projects. The majority of the land in the Metroplex is highly urbanized and therefore closed to any fossil discoveries beneath the city surface - until the next big excavation.. The Trinity River has been important in shaping the DFW Metroplex. Dallas was situated at the best ford, downstream from where the Elm Fork joins the main stream, where the river flows southeast over the chalk. 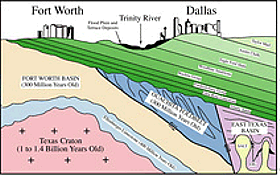 Dallas was also affected subtly by much younger geologic formations deposited by an older, more vigorous Trinity River. The northern hemisphere Ice age occurred in Pleistocene time, when a continental ice sheet reached as far south as Kansas during the Wisconsin glaciation period. The ice age climate had two effects on the Trinity River: It caused down-cutting [few people know that there is a 100 meters (328 ft) deep buried canyon beneath the Trinity in Dallas], and a wetter climate caused much more water to flow in the river. The greater river flow generated great sedimentary terraces. From time to time these terrace deposits reveal bones of extinct giant mammals, such as Mastodons and Mammoths whose skeletal remains have been found scattered and partially intact in the layered terraces. The Pleistocene terraces affected the development of Dallas with a rich alluvial soil and a perched aquifer providing and sustaining the early settlers for many years. Downtown Dallas is built on a series of these terraces, rising subtly eastward from the Trinity river. Note: Much of this material is common knowledge as well as a mix of detail received with permission to use from the Dallas Paleontological Society, University of North Texas and SMU Geosciences Department. Fill is from various detail in Wikipedia sources of which I help author.